Cabling to all of the newly installed lighting columns along Edinburgh Way has been completed. The columns on the north side of the scheme have now been switched on and the old green columns removed, providing working space for the upcoming drainage works. Affinity Water have now completed water pipe diversions allowing all excavations to be back filled and the works area made safe. Openreach are on site installing new fibre optic and copper cables into all of the newly installed ducts across the scheme. These works are required so that the services do not run under the new carriageway once it is completed. Following on from the water main connection, construction of the southern side footpath has been completed and is open to the public. This provides access from Harlow Mill Roundabout to River Way roundabout along the southern side of the scheme. The new footpath on the southern side of the scheme will allow the contractors to install 4 metre deep drainage to the northern side, keeping the work and the public safely separated. Unfortunately this will require pedestrians taking a longer route around Harlow Mill Roundabout to access Harlow Mill Train Station. Please accept our apologies for any temporary inconvenience caused. 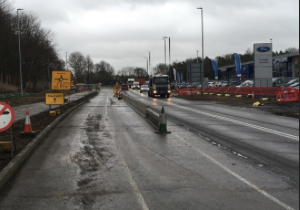 With the footpath now completed on the southern side of the scheme the construction team have been able to move all of the traffic as far south on Edinburgh Way as safely possible while still maintaining one lane of traffic in each direction. This increases the working space to the northern side of the scheme in preparation for the drainage installation works planned for February 2019. The roadworks are set to be completed by the end of 2019. One Response to "Essex Highways give update on Edinburgh Way roadworks"
‘The roadworks are set to be improved by the end of 2019’. Should this read “completed by the end of 2019”?